This is quite possible my favourite illustration in the entire book. I just love the contrast between the alien couple, and their massive pet. 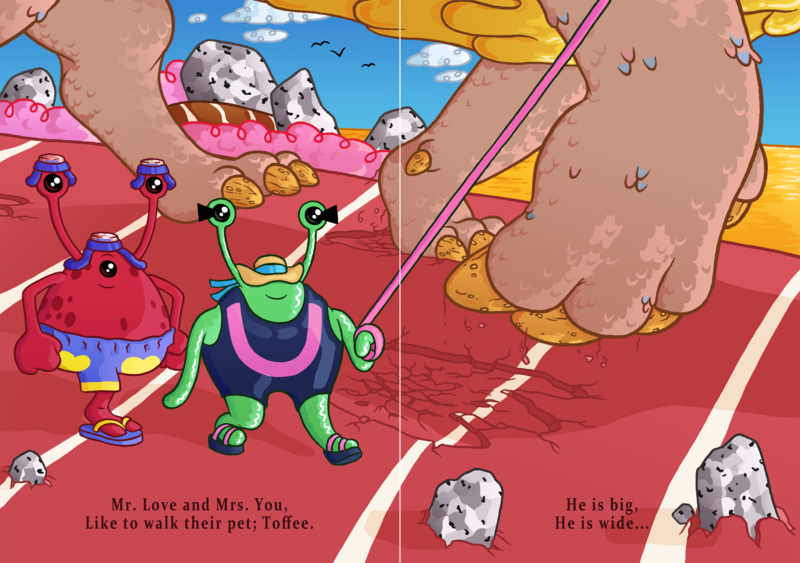 I can just imagine the child’s face who reads this from left to right, being surprised by the big leg behind the alien couple, and then looking right to be wowed by the sight of the massive paw. I especially love how I emphasised the weight of the pet, and its factor of possible danger by having each footstep it takes leaving a crumbled footprint in the hard ground. This is the point in the story where it introduces Mr. Love and Mrs. You’s pet, and it builds the suspense as to what creature it is. Obviously I knew what creature it was when I designed it, and I had real fun thinking of the ways I can compose the images that describe him, but don’t show him in order to keep the mystery of its breed a secret until its unveiling. The best part about him was that he was massive and so this made it easy to incorporate close-up shots of parts of his body, while also adding in Mr. Love and Mrs. You as well. I loved putting in the heightened detail of his scales and his claw texture, which is meant to look like hard toffee; hence his name “Toffee”. I also wanted to show one of the aliens holding what looks like a leash on him to show that the creature is under their supervision and is clearly tamed. But I wanted to subtly show its docile nature by making the leash pink; one of the most non-threatening of colours. Also, the alien couple are in swimwear because that factors into a later event in the book.